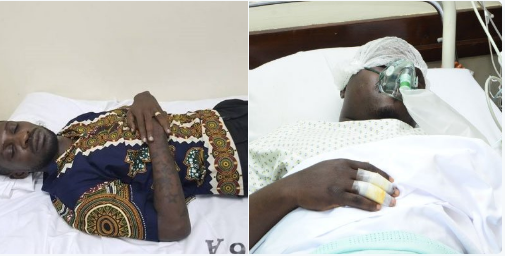 KAMPALA- Ailing MPs Robert Kyagulanyi, aka Bobi Wine (Kyadondo East) and Francis Zaake (Mityana Municipality) have turned down medical examination at Kiruddu hospital in Kampala after being blocked by police from travelling abroad for specialised treatment. Last night, Police blocked Zaake and Bobi Wine from travelling abroad for specialised treatment following torture by security operatives in the Arua by-election campaign violence. They then took them to Kiruddu hospital, a satellite hospital of Mulago, in Makindye, amid heavy police deployment. And now it has emerged that the two legislators have been locked in their admission rooms by their caretakers who have denied doctors from accessing them. We couldn’t immediately speak to the MP’s lawyer Asumani Basalirwa for a comment but family members at the hospital who asked not to be identified told this website that they cannot trust the treatment from government’s sanctioned doctors. Meanwhile, the hospital is under heavy security deployment with several police and army officers surrounding the hospital. Earlier, Nicholas Opiyo, one of the MP’s lawyers, said it is unlawful for police to subject patients to treatment against their will.